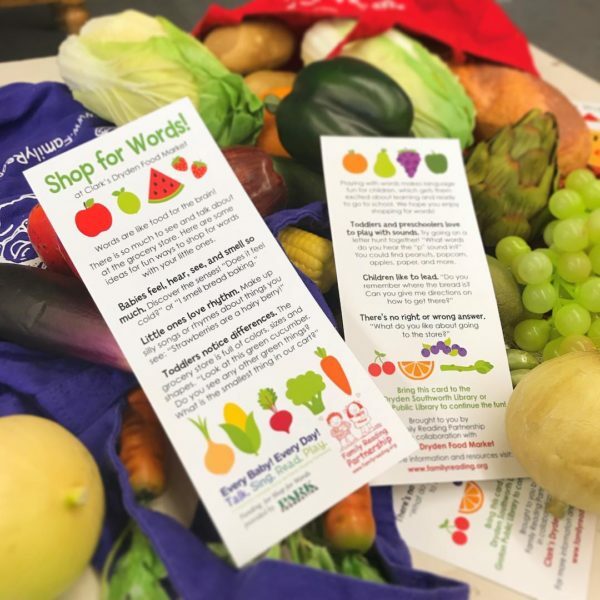 Shop for Words is a pilot project that encourages parents and caregivers to use trips to the grocery store as an opportunity for exploring language with their young children. Colorful bookmark-sized cards are provided at the front of the store to pick up and carry throughout the shopping trip. The cards offer suggestions for talking and engaging with babies, toddlers, and preschoolers based on their developmental needs. When the shopping trip is over families can take the card to a local participating library for a free surprise to reinforce the message that their community supports reading every day. Encourage parent-child interactions during shopping trips. Involve community businesses in literacy efforts through easy to manage activities that enhance the store environment. Increase engagement during other routine excursions and activities by promoting new ways of thinking about learning during daily tasks. Highlight libraries as a local resource and encourage families to visit them regularly. The idea that early literacy activities need to be formally structured around books can act as a barrier to busy parents. Showing that common activities like grocery shopping are rich opportunities to use language can lessen stress and increase positive interactions that support cognitive development. Shop for Words is part of Family Reading Partnership’s Every Baby Every Day initiative. This initiative, funded through a grant from the Park Foundation, launched in January 2014, and is dedicated to all babies having a loving and language-rich environment. Language and literacy development begins even before birth, and is dependent upon hearing words through social interactions, like serve-and-return conversations, with the people in their lives. We want to ensure that every single baby born in Tompkins County, NY experiences talking, singing, reading, and playing every day, beginning at birth or even before. To do this we are launching exciting programs like Shop for Words that re-envision every day activities as opportunities for adults and children to have conversations that encourage children to think about and interact with the world around them. The Shop for Words pilot project was launched at Clark’s Dryden Food Market in cooperation with Southworth Library in Dryden, NY and the Groton Public Library in Groton, NY.